In Scotland, the Church of Scotland (informally known by its Scots language name, "the Kirk"), is recognised as the national church. It is not subject to state control and the British monarch is an ordinary member, required to swear an oath to "maintain and preserve the Protestant Religion and Presbyterian Church Government" upon his or her accession. Splits in the Church of Scotland, especially in the 19th century, led to the creation of various other Presbyterian churches in Scotland, including the Free Church of Scotland, which claims to be the constitutional continuator of the Church in Scotland and was founded in 1843. The Free Presbyterian Church of Scotland was formed in 1893 by some who left the Free Church over alleged weakening of her position and likewise claims to be the spiritual descendant of the Scottish Reformation. The Evangelical Presbyterian Church in England and Wales was founded in the late 1980s and organized themselves as a presbytery in 1996. As of 2016 they had 15 churches in the UK. The Presbyterian Church in Ireland is the largest Protestant denomination and second largest church in Northern Ireland. 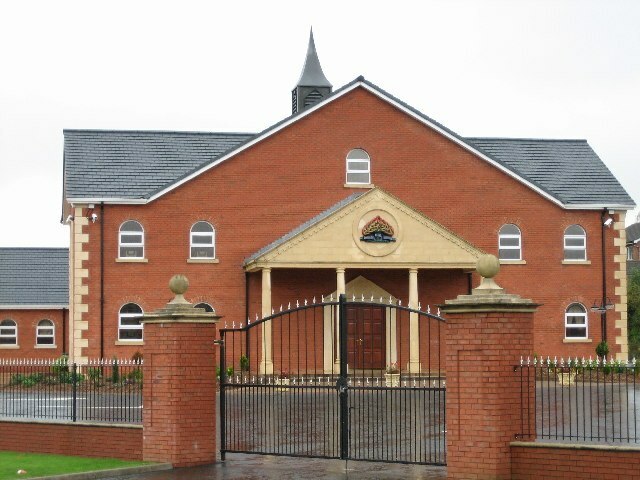 The Free Presbyterian Church of Ulster was founded on 17 March 1951 by the cleric and politician Ian Paisley. It has about 60 churches in Northern Ireland. The Presbyterian Church of Wales seceded from the Church of England in 1811 and formally formed itself into a separate body in 1823. The Non-subscribing Presbyterian Church of Ireland has 31 congregations in Northern Ireland, with the first Presbytery being formed in Antrim in 1725. Assemblies of God in Great Britain are part of the World Assemblies of God Fellowship with over 600 churches in Great Britain. Assemblies of God Ireland cover the whole of the island of Ireland, including Northern Ireland. The Apostolic Church commenced in the early part of the 20th century in South Wales and now has over 110 churches across the United Kingdom. Elim Pentecostal Church as of 2013 had over 500 churches across the United Kingdom. Buddhism in the United Kingdom has a small but growing number of supporters which, according to a Buddhist organisation, is mainly because of the result of conversion. In the UK census for 2011, there were about 178,000 people who registered their religion as Buddhism, and about 174,000 who cited religions other than Christianity, Buddhism, Hinduism, Judaism, Islam, Jainism and Sikhism. This latter figure is likely to include some people who follow the traditional Chinese mixture of religions including Buddhism. The Church of England Assembly (Powers) Act 1919 (9 & 10 Geo. 5 c. 76) is an Act of the Parliament of the United Kingdom that enables the Church of England to submit primary legislation called Measures, for passage by Parliament. Measures have the same force and effect as Acts of Parliament. The power to pass measures was originally granted to the Church Assembly, which was replaced by the General Synod of the Church of England in 1970 by the Synodical Government Measure 1969.The Act, usually called the "Enabling Act", made possible the addition of a chamber of laymen to the chambers for bishops and clergy in the new Church Assembly. The historian Jeremy Morris has argued that it helped to buffer the Church from anti-establishmentarianism and calls it "probably the most significant single piece of legislation passed by Parliament for the Church of England in the twentieth century". The Church Assembly set up parochial church councils, which have formed the base of the Church's representative system ever since. The Doctrine of the Trinity Act 1813 (53 Geo. III c. 160. sometimes called the Trinitarian Act 1812) was an Act of the Parliament of the United Kingdom. It amended the Blasphemy Act 1697 in respect of its Trinitarian provisions. The Blasphemy Act applied only to those educated in or having made profession of the Christian religion. The Act, passed July 21, was also variously known as the Unitarian Relief Act (Trinity Act), The Unitarian Toleration Bill, and Mr William Smith's Bill, after Whig politician William Smith.The Act granted toleration for Unitarian worship, as previously the Toleration Act 1689 had only granted toleration to those Protestant dissenters who accepted the Trinity.The Blasphemy Act was repealed in 1967, implicitly taking the Doctrine of the Trinity Act with it. The Neo-pagan movement in the United Kingdom is primarily represented by Wicca and Witchcraft religions, Druidry, and Heathenry. According to the 2011 UK Census, there are roughly 53,172 people who identify as Pagan in England, and 3,448 in Wales, as well as 11,026 Wiccans in England and 740 in Wales. By law and social custom, Nonconformists were restricted from many spheres of public life—not least, from access to public office, civil service careers, or degrees at university—and were referred to as suffering from civil disabilities. In England and Wales in the late 19th century the new terms "free churchman" and "Free Church" started to replace "dissenter" or "Nonconformist".One influential Nonconformist minister was Matthew Henry, who beginning in 1710 published his multi-volume Commentary that is still used and available in the 21st century. Isaac Watts is an equally recognized Nonconformist minister whose hymns are still sung by Christians worldwide. The Papists Act of 1778 is an Act of the Parliament of Great Britain (18 George III c. 60) and was the first Act for Roman Catholic relief. Later in 1778 It was also enacted by the Parliament of Ireland. Before the Act, a number of "Penal laws" had been enacted in Britain and Ireland, which varied between the jurisdictions from time to time but effectively excluded those known to be Roman Catholics from public life. The Places of Worship Registration Act 1855 is an Act of the Parliament of the United Kingdom which governs the registration and legal recognition of places of worship. It applies only in England and Wales, and does not cover the Church of England (that country's Established Church): it is exempt from the Act's requirements. Nor does it affect the Church in Wales, which remains part of the Anglican Communion although it is no longer the Established Church in Wales. Registration is not compulsory, but it gives certain financial advantages and is also required before a place of worship can be registered as a venue for marriages. The Quakers and Moravians Act 1838 (1 & 2 Vict. c. 77) was an Act of Parliament in the United Kingdom, signed into law on 10 August 1838. Prior to this Act, Quakers and Moravians had been able to give an affirmation in lieu of an oath where one was required; for example, when giving evidence in court. This Act extended that privilege to those who were previously members of these groups and had seceded from them, retaining the conscientious objection to oaths. Any person choosing to make an affirmation under this Act was required to give a declaration to that extent, and would remain subject to the normal penalties of perjury for falsehood. The Regius Professorships of Divinity are amongst the oldest professorships at the University of Oxford and the University of Cambridge. A third chair existed for a period at Trinity College, Dublin. The Oxford and Cambridge chairs were founded by King Henry VIII. The chair at Cambridge originally had a stipend of £40 per year (which is still paid to the incumbent by Trinity College), later increased by James I with the rectory of Somersham, Cambridgeshire. Judaism, Buddhism, and the Bahá'í Faith. There are also organisations promoting irreligion, including humanism and atheism. Christianity is the largest religion in Northern Ireland. According to a 2007 Tearfund survey, Northern Ireland was the most religious part of the UK, with 45% regularly attending church.The Catholic Church has seen a small growth in adherents, while the other Christian groups have seen a small decrease.